The Perspectives on Listening Symposium in Brisbane this last December gave me the incentive to edit up a soundscape from our recent trip to the Huon Peninsula in Papua New Guinea. Leah Barclay invited myself (Andrew), Tony Baylis, David Stewart, Rod Thorn and Sue Gould to form a panel to discuss the trip and how we approached our sound recording. David, Rod and Sue were unable to attend, but Tony Baylis and I showed images and contrasted our individual field techniques and results. My impression of our one hour session was that many in the audience were particularly fascinated to hear of Tony’s bioacoustic field work. Meanwhile, I edited this soundscape as an installation on multiple headphones so participants could immerse themselves in the rainforest during breaks in the symposium program. The edit is compiled from seven sources, each about five minutes in duration, and representing aspects of the various altitude ranges to which we trekked and recorded. Timings are for approximate transitions. I’ll be publishing extended recordings for free listening on our Listening Earth website in the near future, and will post specific links here. 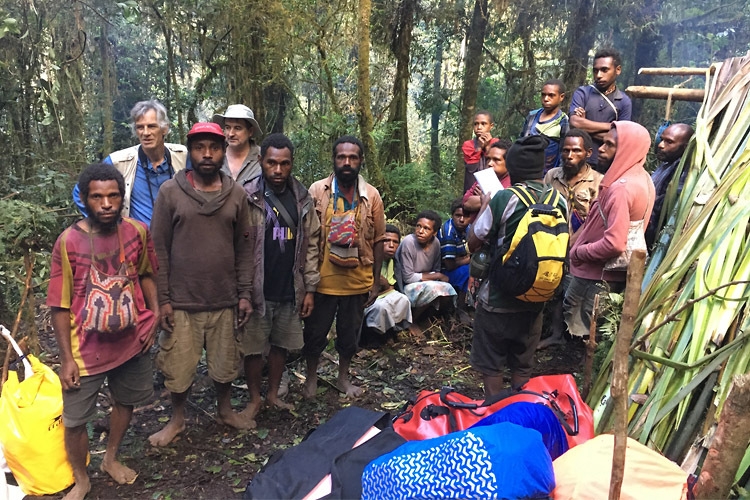 Five members from the AWSRG have recently been field recording in the mountain forests of the Huon Peninsular in Papua New Guinea. 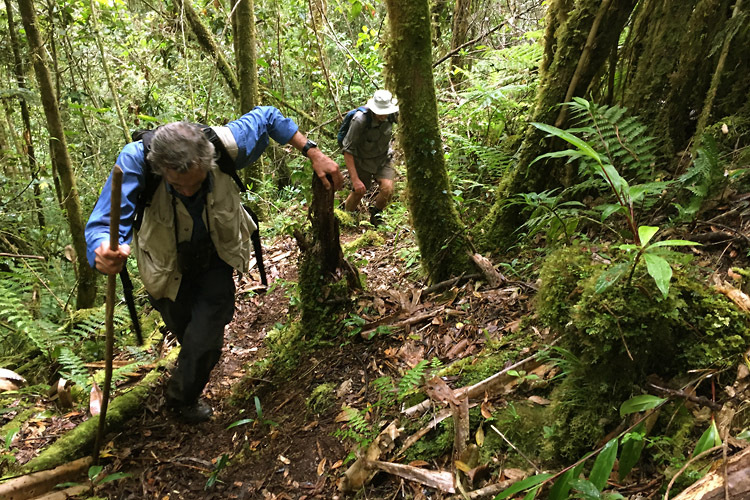 With three previous years recording in the region, Tony Baylis organised and lead this year’s expedition, comprising Sue Gould and her partner Rod Thorn (who both accompanied Tony last year), plus David Stewart and myself, Andrew Skeoch. 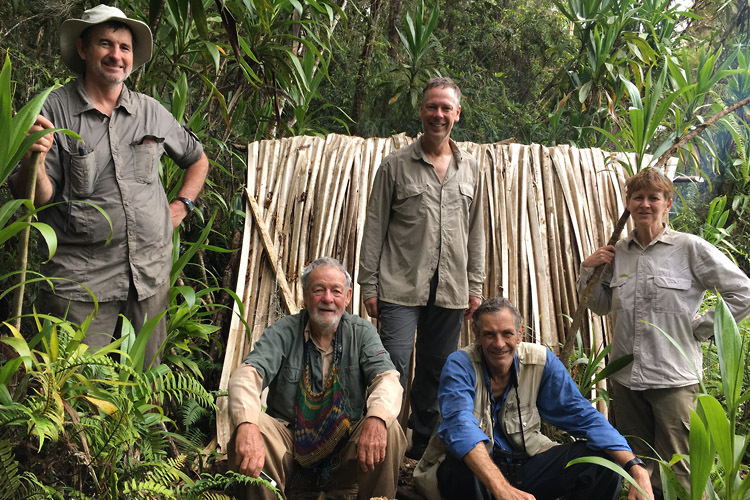 On the trail in Papua New Guinea – (from left) Rod Thorn, David Stewart, Andrew Skeoch, Tony Baylis and Sue Gould. Tony’s connections with the local people were crucial to the expedition. Without permission and support from local landholders we simply could not have visited these forests. We hired porters from nearby villages to assist in moving all our equipment and supplies between camps. Here they arrive at our first bush camp in the morning, ready to help us relocate further up the mountain. Tony and Rod ascending slowly. Trekking was exhausting, a combination of altitude and a vertical landscape. Often a day’s walk with only modest altitude gains, would involve first descending into a deep valley and then climbing up a sheer slope beyond. The locals were adapted to it, padding along in bare feet, but slippery rocks, mud and hidden tree roots were treacherous in our hiking boots. We relied on our walking poles for both balance and secure footing.